The Lady of the House and I were on an epic road trip in Arizona and Utah. At the first two tourist attractions we visited—bam! bam!—penny presses! Penny presses outside the Meteor Crater Natural Landmark gift shop. shop—and the presses—were deep in the complex, well past the entrance where folks pay the admission fee. If you don’t plunk down $18 for admission, you’re not getting anywhere near those penny presses. We saw the presses at the beginning of our visit, but we spent the little-less-than-an-hour before our guided tour (included in the price of admission) picking out postcards and a t-shirt for The Boy after freshening up in the restroom. We didn’t have time for immediate penny pressing. After the tour, we made a quick exploration of the Discovery Center, then looked at the bottom of the crater with the free telescopic viewer. Then it was time for the penny press. Turns out, The Lady of the House enjoys pressed pennies. Before we left town, she mentioned she was saving her quarters to use in penny press machines. She was pleased to see those penny presses outside the gift shop. First she had to pick the design she wanted on her penny. Should I get the picture of the crater or the picture of the meteor about to crash into the earth? she asked me. You saw the crater, I reminded her, but you didn’t see the meteor. That’s what I was thinking! she said, then began the penny pressing process. She lined up her design choice and put in her coins. Then she turned, turned, turned the crank. Soon her souvenir penny clanked into the dispenser cup. 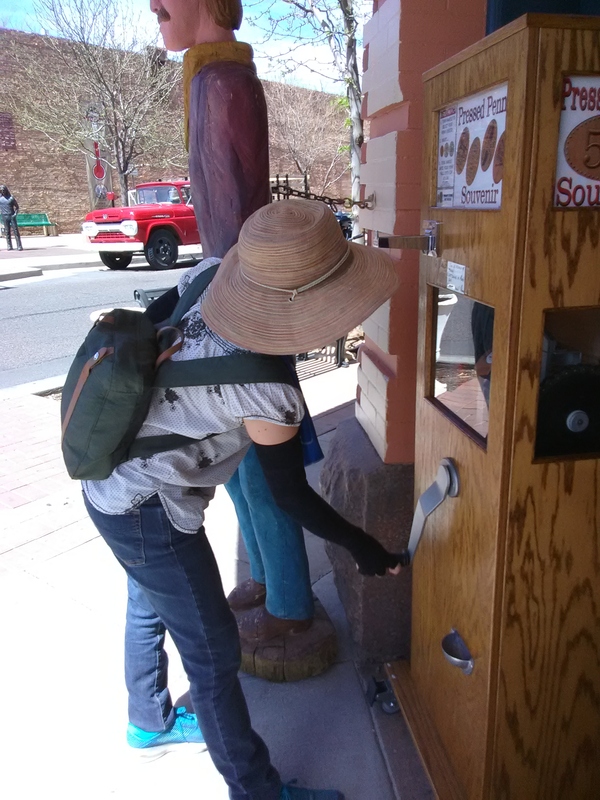 The second penny press we found was in Winslow, Arizona. The Lady had never been there, and she wanted to see the Standin’ on the Corner Park. We pulled off the I-40, and I navigated the van through the town to the park. We found a free spot half a block away to leave the van, then walked over to the famous corner. On the way, we passed a gift shop across Kinsley Avenue from the park. Right outside the shop’s door stood a penny press machine. Penny press in Winslow, Arizona. After we took our photos in the Standing on the Corner Park, The Lady stood in front of the machine to choose her design. She’d used up all her quarters at the Meteor Crater gift shop, so after she picked out which penny design she wanted, she went inside the gift shop to get four quarters for a dollar. The woman working the cash register offered her pennies too, but The Lady said she had some. The worker said her pennies were bright and shiny, so The Lady accepted a few. The bright and shiny pennies did make for a nice souvenir after The Lady turned, turned, turned the crank. At that point I started wondering if I should start collecting pressed pennies. Fifty-one cents is a good price for a souvenir, The Lady told me. My main concern was what I would do with a bunch of pressed pennies. Would they just sit in a bowl or a drawer? Would I ever remember to look at them? The morning after the Arizona double penny press experience, I was lying in my bed, looking up at the ceiling of my van. There are three wooden strips, each about two inches wide running across the width of my van. I could glue pressed pennies to those wooden strips, I realized. I could display my collection in my van! It’s too late to get a pressed penny from Meteor Crater, but maybe someday I’ll pass through Winslow again. 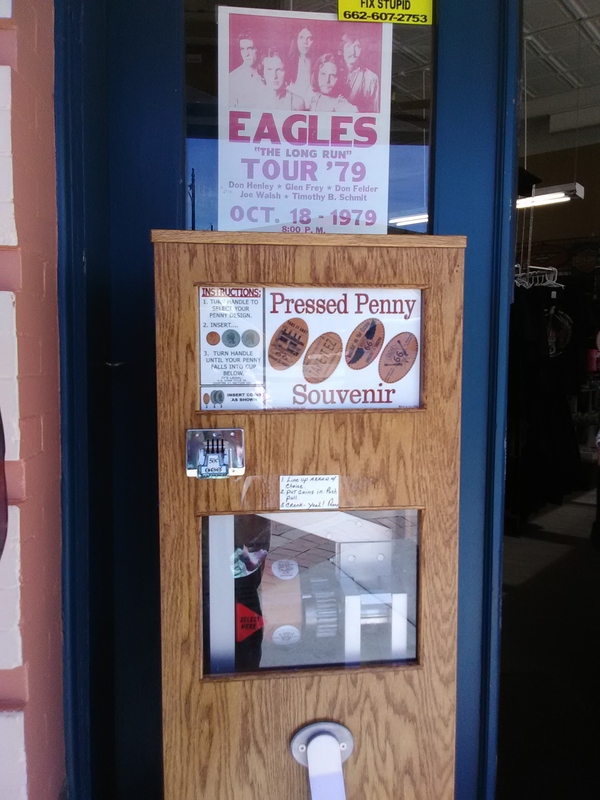 I also know where to get a pressed penny when I go through Quartzsite, AZ; Baker, CA; and Las Vegas, NV. I’m sure my collection will grow in time.